There are few things we Indians love more than a good deal. We want our cars to be as luxurious as vehicles that cost twice as much. We want more power, but our cars also have to go further and further on a litre of fuel. We demand modern design, but we can't sacrifice space and practicality. Driving pleasure is dictated by how easy the car is to drive  sure the average buyer likes a good handling package but almost never accepts it at the expense of ride quality. And to top it off, we demand all this at as low a price as possible. Now that's a tall order. But if anyone has been successful at providing a solution, it's Hyundai. The brand is the second largest in the country simply because it ticks off the most items on the average Indian buyer's checklist. Their cars are stylish thanks to the Fluidic design philosophy, and their engines are powerful but also impressively frugal. However, most importantly, they've mastered the art of offering plenty of features for an attractive price. The Grand i10 is the latest Hyundai from this school of thought, and we immediately identified it as typically good VFM in our road test last month. 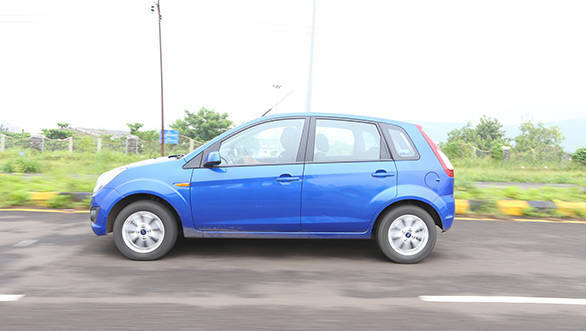 The question is how it holds up against one of the better value hatchbacks on sale today - the Ford Figo. Just for good measure we also decided to throw in the new Nissan Micra that happens to offer very similar levels of kit to the Grand. The Hyundai takes the first round - it's easily the most stylish car here. The Fluidic design philosophy can get rather overdone, but Hyundai's designers have restrained themselves just a little with the Grand. 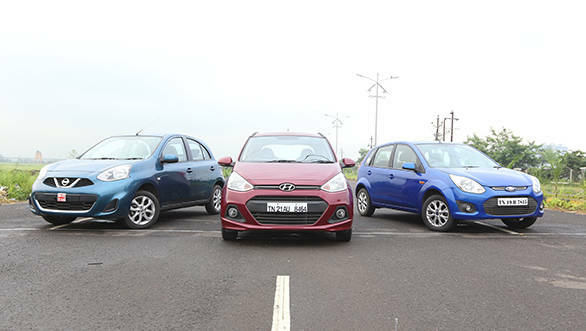 The front end is an evolution of the i10 and i20 and features revised soup spoon-shaped lamps like the ones on the Eon. The clean side profile gets some smart plastic cladding that also protects the doors. The rear, however, is easily our favourite angle with smart tail lamps and sculpted bumpers that give the car a chic, European look. Good looking 14inch alloys that despite being an inch smaller than the ones on the Micra complement the design well. The Grand's interiors keep the great design theme going. Once again, Hyundai has chosen to tone down the exuberance of their designs and the result is great. The dual-tone dash looks smart and the quality of materials feels great for the price. What's especially nice is that all the surfaces you touch, such as the steering wheel, gear knob, door pads and power window switches feel great. The seats have height adjust, but I found the steering wheel way too low even with the seat in its lowest position and the steering in its highest. But then again, I'm taller than the average Indian. Space is surprisingly generous with slightly more usable rear knee room than the other two. All three, however, have good levels of space, both the cabin and the boot. The new Micra facelift adds some much-needed testosterone to the design, but it's still a very rounded, bulbous shape. The front end gets some more aggressively contoured bumpers, a new bonnet, sharper headlamps and splashes of chrome around the fog lamps and grille. The side stays largely the same, while the rear gets some LED detailing in the tail lamps and a new bumper. 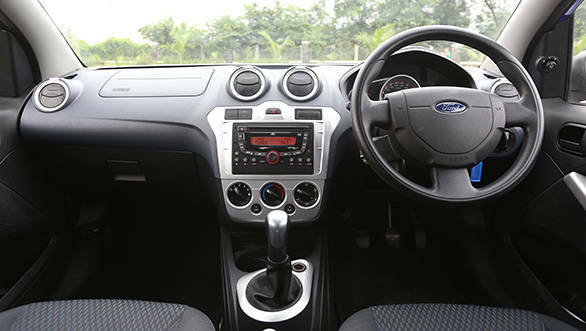 The interiors get a comprehensive update as well with a new centre console finished in glossy black. The excessively rounded theme has thankfully been toned down, with rectangular central air vents replacing the old circular ones. The quality of materials, though, hasn't changed and you get the same staid grey plastics all around. The black plastic also tends to get moist when the aircon is on for extended periods and that's not very pleasing to the eye. The seats are large but flat and lack enough thigh support. The Hyundai uses a brand new 3-cylinder engine, and the first thing you notice is that you don't notice it's missing a cylinder. That's impressive and Hyundai have accomplished it by giving the car comprehensive noise deadening. Refinement levels, as a result, are high and the car is pleasantly quiet on the inside. Power stands at 71PS while torque peaks at 163Nm (1500-2700rpm). The engine has excellent low down grunt and pulls from just above idle. There's a strong mid-range surge, but the top end is flat and there's no point revving it much beyond 3500rpm. Performance is just about adequate with a 0-100kmph time of 15.3 seconds and a top speed of 156kmph. What's phenomenal, though, is the fuel efficiency. The Grand returns an unbelievable 19.3kmpl in the city and 24.2kmpl on the highway. That makes for a highly frugal 20.5kmpl overall. The Figo uses Ford's tried and tested 1.4-litre Duratorq engine. It displaces a good 300cc more than the Hyundai but still produces less power with a total of 69PS and an identical 160Nm of torque. 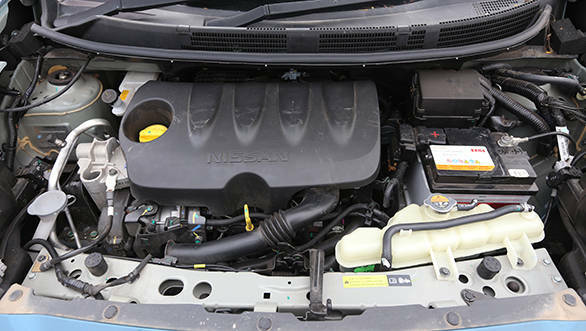 The engine has a refined and rev-happy feel, and also feels very linear with a strong bottom end that makes it great for driving around in town. It doesn't feel too slow thanks to the great drivability, but the Figo is the slowest car here; 0-100kmph takes a slow 16.1 seconds and it tops out at 150kmph. And that's sad given what an absolute hoot this car is to drive. But more on that later. The Figo will run a commendable 17.2km on a litre of diesel, but it's still way off the Grand's figure. Nissan uses Renault's K9K diesel engine for the Micra, and it's in basic 64PS guise. 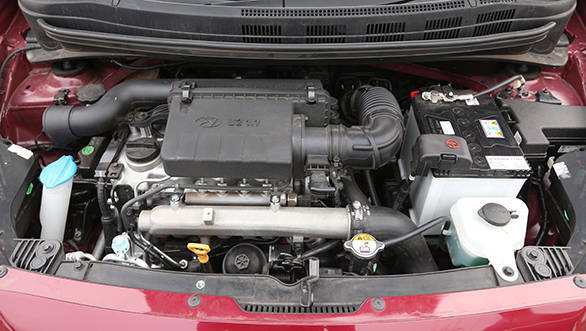 Like the Ford, this engine uses just two valves per cylinder as against four in the Hyundai. 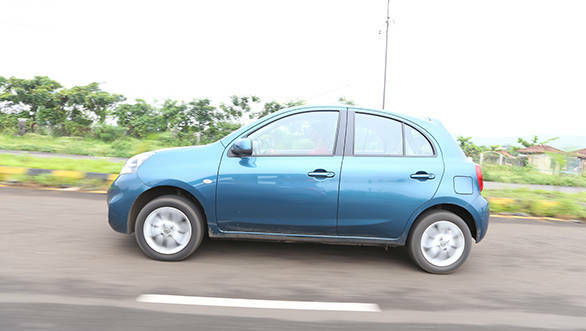 The Micra accelerates even slower than the Ford taking a tedious 16.5 seconds to hit 100kmph, but its top speed is a little higher at 158kmph. What makes this even more painful is that this is the loudest and most unrefined of the lot. It also has a very notchy gear throw as against the slick and smooth box in the Hyundai. The Ford on the other hands has one of the best feeling gearboxes in the business with short throws that land with delightful weight and precision. We got an overall figure of 17.5kmpl in the Micra which is just about on par with the Ford. This is where Hyundais generally lose the plot. Soft suspension and artificial-feeling steering make for a very forgettable driving experience. That being said, the Grand has seen significant improvement over the old i10. 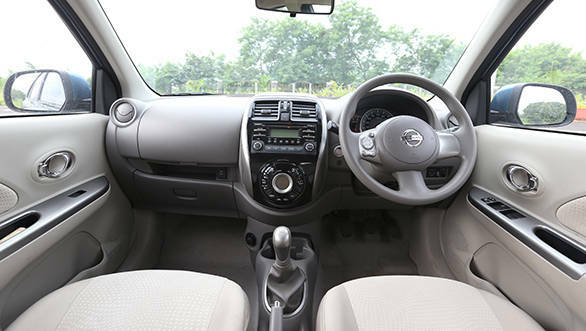 The ride has good amount of compliance, and the familiar feeling of softness at the rear only creeps in once speeds cross about 90kmph on bumpy roads or if the car is loaded up with passengers and luggage. Straight line stability is good, but the car still isn't an eager handler and runs out of grip sooner than we'd like. Vague electrically assisted steering with an irritating tendency to swing back to the centre at slow speeds further mars the situation. 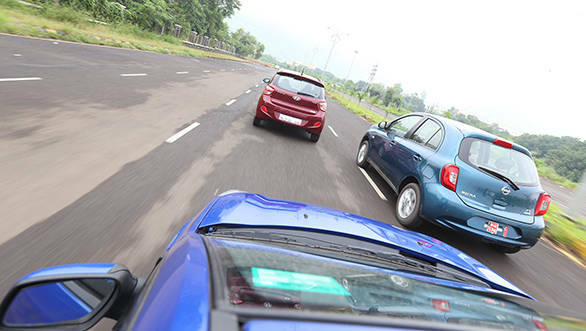 The Grand i10 then is comfortable but not exciting. The Figo, on the other hand, is simply one of the best-handling affordable hatchbacks available today. It turns in with surprising sharpness, has a planted but agile feel and benefits from a proper hydraulically assisted steering that offers so much feedback. Jump into the Figo after the other two and the steering feels strangely heavy after the light and lifeless units in the competition. However, once you get used to the extra weight you'll start to love driving the Figo. The pedals are well-placed, the seating position is spot on and the gearbox is a joy. Thankfully, the Figo also has great low speed ride, albeit with a hint of stiffness. The Figo is such fun that you forget the power deficit on a winding road. but you simply can't help wish for more power. The Micra feels the largest but it's also very easy to drive. 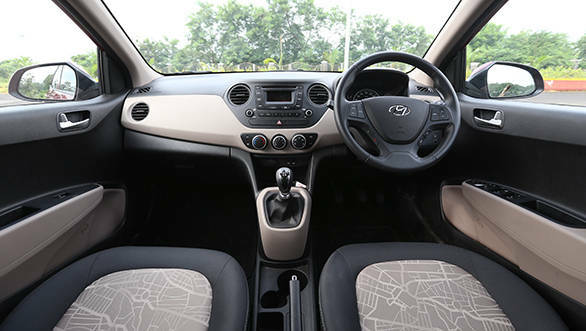 The steering is as light as the Grand i10's but without the inconsistent feel. Ride quality leaves nothing to desire and the car feels comfortable at town speeds and a little soft as the speeds rise. The Micra then is similar to the Grand in that it's comfortable and usable, but not involving in the least. The Grand takes no prisoners; it's easily the most kitted out car on test. The top-end Asta that we're driving is the only small car that offers rear AC vents. You also get a cooled glovebox, steering-mounted audio controls, and a good sounding audio system with 1GB of internal storage and Bluetooth connectivity. Along with push button start, you get power folding and adjustable mirrors and parking sensors. The Micra packs very similar kit levels and it even offers a reverse camera on the top-end XV P variant. The only difference is the Hyundai is much better packaged with better materials and simply feels more premium. The Figo by no means lacks features  like with the other two you get two airbags and ABS. The car offers a great sound system and Bluetooth connectivity and you get audio controls mounted behind the steering wheel. That being said, it still doesn't match either of the other two and feels the oldest as well. At 7.45lakh ex Mumbai the Micra is over a lakh more expensive than the Figo and a good Rs72,000 more than the top Grand i10. The Micra doesn't offer any real advantages over either of the two. All three are very similar in terms of space. The Figo is by far the best car in terms of driving pleasure, but it feels a rather outdated. 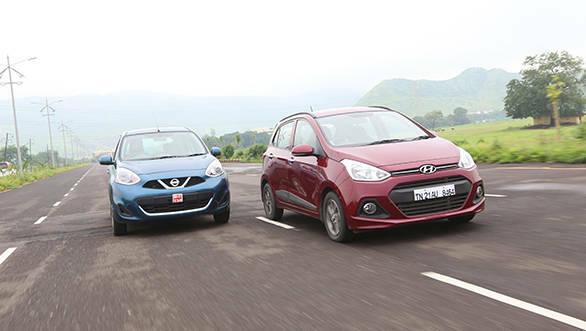 While the Grand i10 scores in terms of design, build and features, it also happens to be both the quickest and most efficient car here. If the Micra was priced lower it would have been a good contender to second place, but third is all it gets in this company. 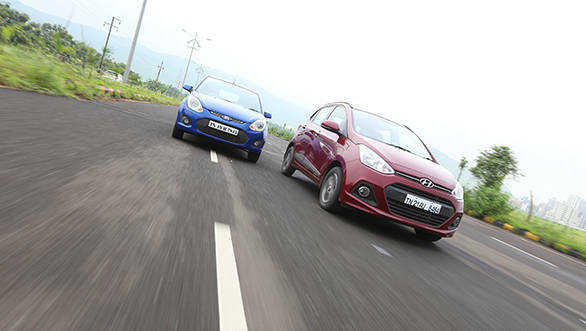 The Grand i10 on the other hand is the clear winner.